Kdy bude opět na skladě? jakmile bude tento produkt opět na skladě. The material is a printed cloth with flower motive - colored roses and leaves on dark background. Line of dress is tight, the material is not too stretch and looks heavy. The dress has a zip at the back. All inner seams of bodice are hidden, there is lining of the black color. Enjoy nice contact and look during wearing of the dress. This is one dress of limited edition, therefore the flowery pattern can be placed variously, but always with nice and contrast large flower motive on the skirt. 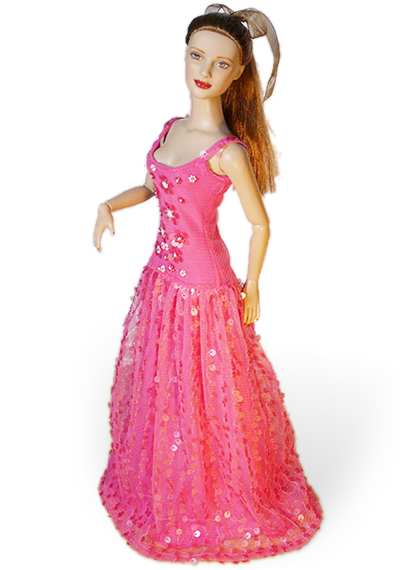 The line of dress is exactly fit for 16inch fashion Tonner doll of Antoinette/Cami type of body. It is not suitable for other dolls with larger bust. View the picture gallery with more and high-resolution photos. The condition of all materials is new, coming from a smoke free environment. Only one dress is included. The dolls are not included! This product is not a toy. Use as decoration only. I'll put a printed leaflet with short description and care about into the pack. Komentář smí přidat pouze přihlášený uživatel.